In Windows 8.1 Microsoft provides its own Metro-style application called Windows Reader for viewing Adobe's popular document format. Windows Reader presents a very simple full-screen experience, like other Metro-styled apps. PDF Viewer for Windows 8.1 is such a reader that offers decent capabilities and performance as well as versatile functionalities as a native application and is extremely useful for those that typically stick to the Windows 8.1 desktop experience. 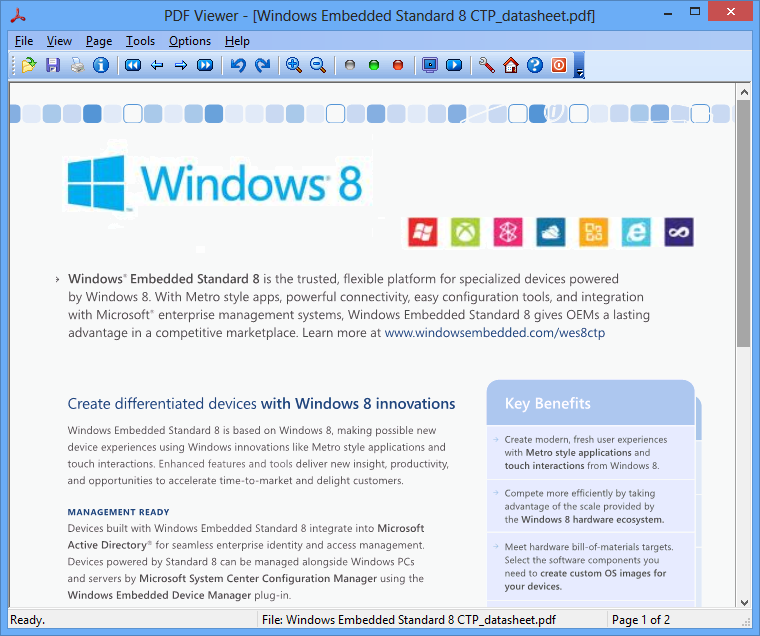 PDF Viewer for Windows 8.1 sports three reading modes, Fit Page, Center Page, and Continuous. Native PDF viewer maximizes your desktop user experience without the need to switch between Classic UI (Windows Desktop) and Metro UI (Slate). PDF Viewer for Windows 8.1 is backward compatible with Microsoft Windows 8, Windows 7, Windows Vista, and Windows XP. All products support Microsoft Windows 8.1 64-bit (x64) and 32-bit (x86), and are backward compatible with Microsoft Windows 8, Windows 7, Vista, Windows XP, Windows 2000, Windows Server 2003, Windows Server, 2008 and Windows Server 2012.